I’m not a huge fan of either of the genres represented today — Westerns and Epidemics. Choosing strictly based on TCM summaries and IMDB reviews, I’d pick The Dude Goes West with Eddie Albert and Gale Storm at 4:30 p.m. At 8:00 p.m. the Epidemics begin contamination, led by The Andromeda Strain. Based on a novel by Michael Crichton and directed by Robert Wise (Somebody Up There Likes Me, West Side Story), it seems to be the least chintzy of the lot. 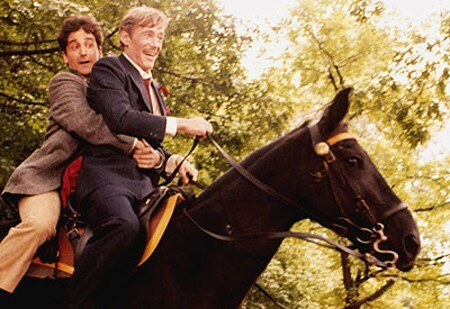 Benjy (Mark Linn-Baker) is in for a wild ride when he babysits Alan Swann (Peter O'Toole) in My Favorite Year. Writer-director-producer James L. Brooks (of Terms of Endearment and Broadcast News fame, among many others) is tonight’s Guest Programmer, beginning at 8:00 p.m. with This Is Your Story, which I haven’t seen. I’ve not seen Prince of the City (2:00 a.m.) either. But I love Brooks’ other three choices. My Favorite Year (8:15 p.m.) is about a 1940s radio show writer (Mark Linn-Baker) trying to keep fun-loving actor Alan Swann (Peter O’Toole doing his best Errol Flynn) sober and vertical, at least until Swann can guest star on that week’s broadcast. Dr. Strangelove (10:00 p.m.) and Network (11:45 p.m.) are two of the most prophetic movies ever made — the former foreshadows the increasing dominance of the military-industrial complex, the latter prefigures the rise of reality TV and that medium’s overall “if it bleeds, it leads” ratings-first mentality. Frank Capra’s follow-up to the now-beloved flop It’s A Wonderful Life was made as Truman defeated Dewey and the House Un-American Activities Committee investigated Hollywood. It’s about a presidential candidate who gets mixed up in the dirty side of politics. Though Star of the Month Angela Lansbury was in her early twenties when she made this film, she was nonetheless cast as Spencer Tracy’s character’s fortysomething mistress. TCM’s tribute to cinematographer Jack Cardiff continues tonight with my favorite films of his, those he did with Michael Powell and Emeric Pressburger, collectively known as the Archers. Cardiff was the foremost practitioner of Technicolor and an accomplished fine artist who — I can’t think of any other way to say this — painted with light. I don’t think anyone else could have done the beautiful work he did. Put that together with the excellent direction, writing, art direction, acting, etc., and you have some incredibly fascinating and moving films. We are lucky to have this excellent documentary as it seems as if Cardiff passed away not long after it was completed. But if you haven’t seen tonight’s films, my advice is to record this or wait until it’s rerun next Thursday…seriously. You want to experience the magic before you see how it was done. Director Clarence Brown guided Greta Garbo from the silents into talkies and was a favorite with the star, apparently because, he said, “I had a special way with her. 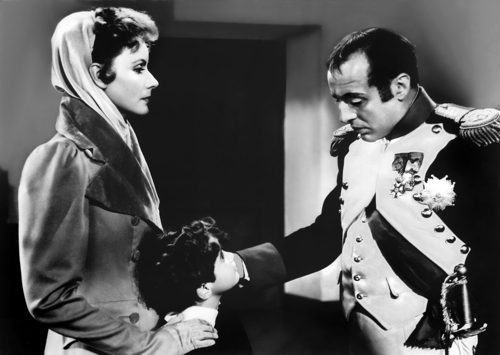 I never gave her direction in anything louder than a whisper.” This was the last film they made together, the story of a Polish countess (Garbo) who gets involved with Napoleon (Charles Boyer). I’ll be setting the DVR for this one as I’ve never seen it, but with Spencer Tracy and Katharine Hepburn starring, and George Cukor directing — he also directed Hepburn in my favorite movie of hers, The Philadelphia Story — it should be good. Abbott and Costello spoof scary monsters and the horror genre beginning at 8:00 p.m., in a block that includes Abbott and Costello Meet Frankenstein, Abbott and Costello Meet The Invisible Man, and Abbott and Costello Meet The Mummy. Posted on 8 January 2012 by PaulaPosted in 2012 Picks, TCM PicksTagged 1930s, 1940s, 1980s, classic film, classic movie schedule, classic movies, TCM. I’m going to have to check them out, I don’t think I’ve ever seen one. I’m more versed on the Three Stooges and Laurel & Hardy, my grandmother loved them. Glad she’s not around to see the Stooges remake…she wouldn’t be happy at all LOL! What a cute picture there of O’Toole! I have not seen any of these, but that shouldn’t surprise you 🙂 So Paula are you sad that TCM in going to a higher cable subscription? I know my classics-loving friends are fuming about it. I am sad about TCM, yeah 😦 Anything that decreases access to classic movies makes me sad. It’s already out of reach for a lot of people who can’t afford it or don’t want all the other channels or whatever. Enjoyed Col. Blimp last night. Looking forward to Conquest tonight. I enjoyed the 1970s “Waterloo” It will be fun to see another cinematic Napoleon.